This morning I popped over to my local Nordstrom to check out what's new for Spring. 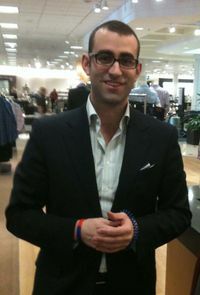 David Angiulo helped me choose some styling shirts that I can wear with my Peter Millar blue suit. As we were heading to the cash register, he asked me if I'm on Twitter. It was a very low key, very casual question. It did not feel pushy in any way. "Absolutely," I said. "Are you?" Damn. I wanted to learn more. Sometimes he comments on what's happening, like this tweet on the Academy Awards: "I think my vote goes to Colin Firth for best dressed last night..or maybe Tom Hanks-just proves again you can't go wrong with a classic look"
Dave also told me that he has a bunch of clients who he sends direct messages to. 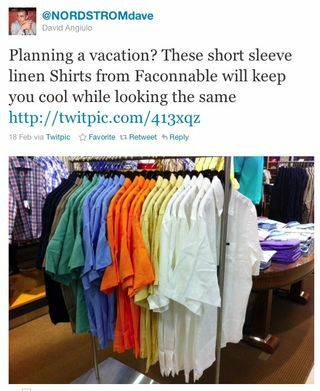 He knows their taste in clothing and when something new comes in, he informs the client, privately, right away. This real-time effort frequently generates sales right away — Dave already has the customer’s size and payment information and he ships the item right out. Brilliant. In a corporate environment where many companies fear letting employees use social networking, Nordstrom is doing it right. Yes, there is a corporate @Nordstrom Twitter account, but Dave's personal touch is a fantastic way to use Twitter for business, pushing the interaction down to people who work directly with customers. To be sure, this is Dave's initiative. He's making it happen. But the effort is fully supported by Nordstrom. Dave has access to computers and iPads at work to tweet and he usually uses his personal iPhone for the photos. As I was checking out his Twitter feed upon returning to my office, I found myself fascinated by a video that Dave pointed to about Ex-Girlfriend Jeans. Dave's not too fond of them. Can't say I blame him. Others jumped into the Twitter discussion. I'll DM @NordstromDave next time I need something. I want to make sure he's there before I go in.